Image optimization is one of those things that anyone involved in web development should be thinking about if they aren’t doing so already. Personally, I think if you’re involved in the field, you eventually bump up against the need for it when working on a project for yourself or someone else. 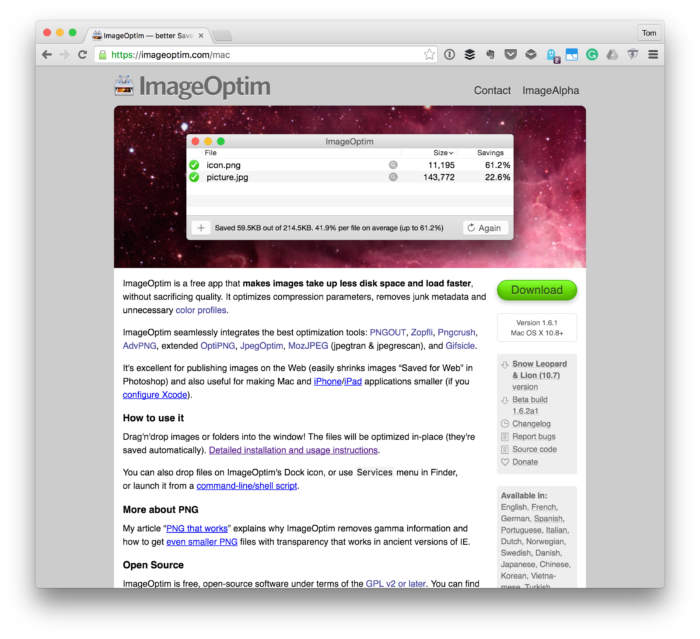 And in WordPress, there are a lot of plugins and other options that we have for optimizing our images (and other assets. But what if you’re looking to do so while working with files on your local machine there are some different ways of doing so. I’m actually in the process of migrating some different sites to different hosts right now (speaking of which, this may be interesting reading for those of you who manage sites on shared or budget hosting). In the process of doing so, I’m taking the opportunity to optimize all of the images that are being migrated and optimizing them. Bt I’m not using a plugin or other web-based tool to do it. In short, it’s Mac app into which you can drag image files and have it process them automatically so that you don’t have to deal with duplicate filenames, new file locations, and all of that. I’ve found it to be a solid resource when working with WordPress-based sites because it makes working with the uploads directory and thus the Media Library so much easier. Finally, the app is open source and available on GitHub if you’re interested in viewing or contributing to the source code. Furthermore, for those who are wondering, image optimization for the web is something that’s not new, but it’s something that helps page load time (which does factor into your search results). On top of that, if you have visitors that are coming from all over the world, then their connection may not be as fast or the time it takes the data to travel from your host’s data center to their computer could be (and likely is) longer than it does to travel to you. Ultimately, it impacts their experience, and we should aim to make it as robust as possible. No, this isn’t the primary tool I use, but if you’re in the process of a migration and looking for a tool for batch image optimization that’s not a plugin or web-based tool, I recommend it. Any recommendations on WP Plugins/Services for image optimization on an on-going bases? I’ve used a few plugins for clients, and most are now utilizing a paid API platform, which doesn’t always fly with some clients (I know, I know). This is a good question as it’s something I’ve been looking for myself. The short answer is that I don’t have one recommendation that I’m super passionate about although I have used Imsanity for a number of different sites I’ve worked on and it’s worked out alright. There are a few others (like WP Smush) but I can’t vouch for them as I haven’t tried them. May I ask if you know of a Windows software that is as simple and effective as ImageOptim? I have tried FileOptimizer, but AFAIK it does not support lossy compression unless one tinkers with ini files. Previous PostPrevious Would You Be Interested in Premium Content?